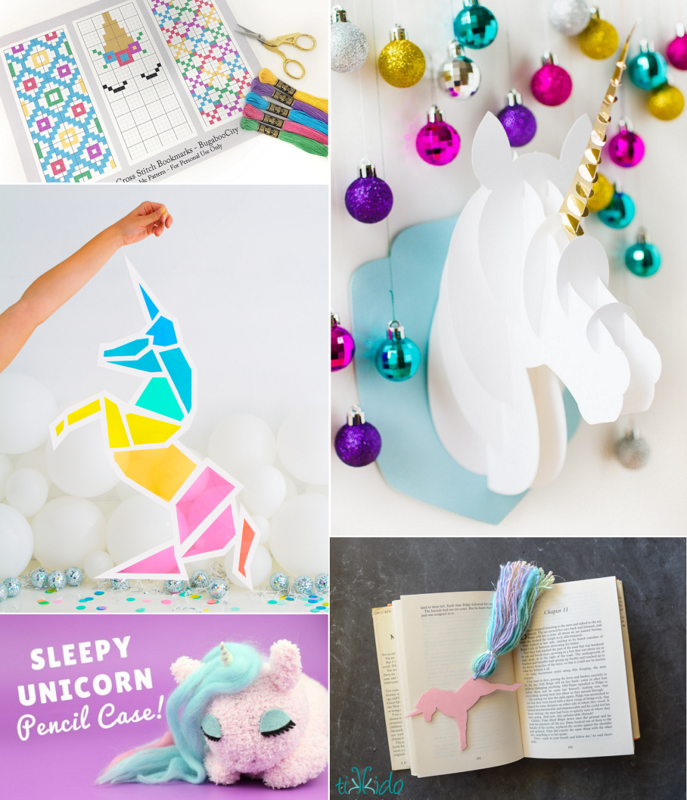 Last month, I needed an idea for small gifts, so I searched for interesting unicorn crafts. Here’s a short roundup of my favorites. Shellie Wilson at Kids Crafts. So cute – I just want to cuddle it! Naomi Julia Satake via Oh Happy Day. 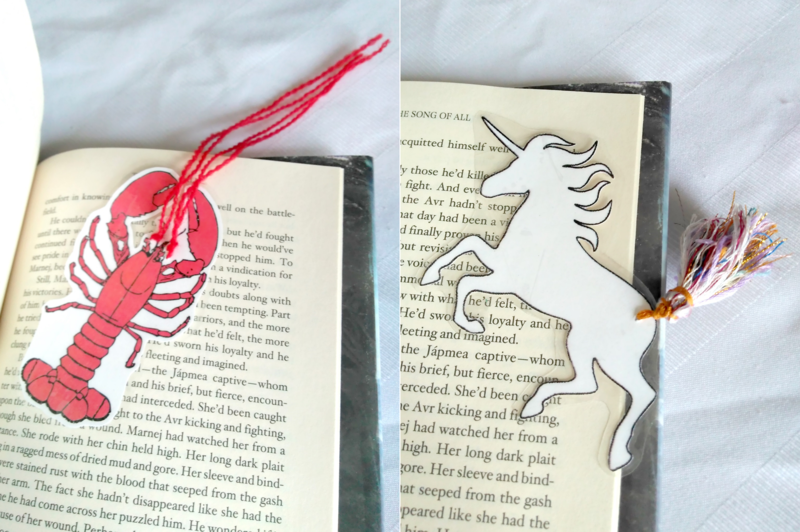 She made a gorgeous hanging unicorn reminiscent of stained glass windows from posterboard and gel filters. Such an elegant DIY. I am really intrigued by all of these projects, though, and might get back to one or two later. 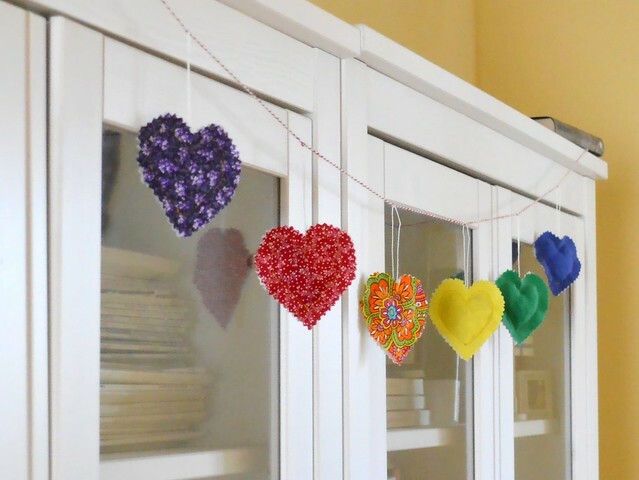 A batch of heart banners is now listed at the Playfully Grownup Home Etsy shop. 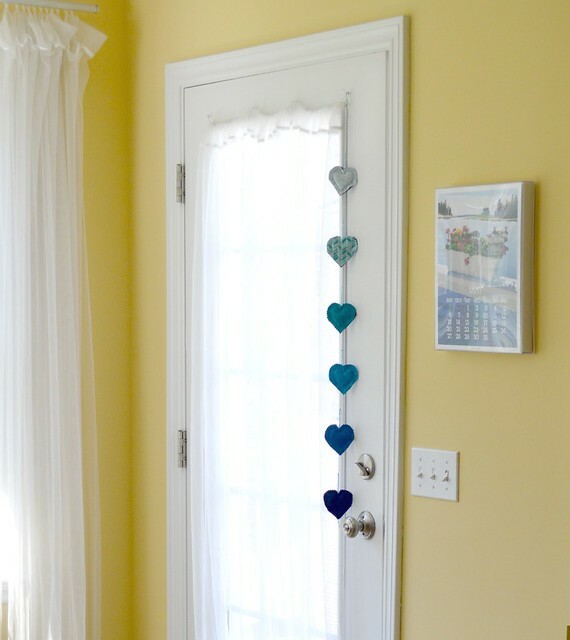 They’re made from a variety of prints and solids, and are designed to hang either horizontally or vertically against a wall or another flat surface. I used up a variety of remnants and scraps to make them, which reduces waste, as does filling the hearts with clippings (thread and shredded fabric). Some of the banners, like those in pink and red tones, have an ombre effect, with the colors graduating from light to dark shades. Apart from the ombre banners, there are cheerful floral ones in a colorful, graphic print that I love. Find them in the Playfully Grownup Home > Hang Me section. And as always, if you have any questions please don’t hesitate to ask! Arts & Crafts, Geek out! Here is my donation for Con or Bust‘s yearly online auction for 2018: a rainbow heart banner. Each heart measures approx. 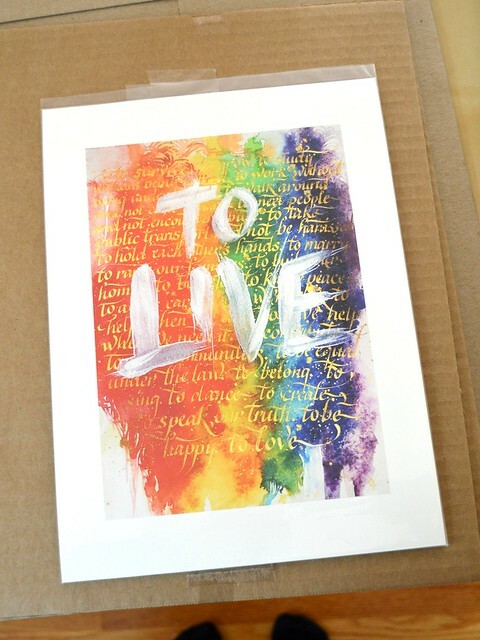 3” / 7 cm, and there’s one of each color (purple, red, orange, yellow, green and blue). They have vibrant fronts made from a variety of cottons and cotton blends, and the backsides are made from a linen blend in a neutral greyish beige hue. All fabrics come from my scraps bin, which reduces waste, as does filling the hearts with clippings (thread and small waste fabric). The hearts form an approx. 53” / 135 cm banner with the help of baker’s twine, with loops at both ends for hanging. Because of the neutral backing, the banner looks best hung against a wall or other flat surface. However, as I strung it up for photos, I noticed that the hearts have a tendency to swivel, which would make a nice effect if hung somewhere where air currents can gently sway the banner. Bidding will start next Monday, April 09, 2018. Before that, you can have a look at the 2018 auction info, visit the Con or Bust website for more information or browse the 2018 auction tags. Con or Bust, Inc., is a U.S.-based, tax-exempt not-for-profit organization that helps people of color/non-white people attend SFF conventions. Con or Bust isn’t a scholarship and isn’t limited to the United States, to particular types of con-goers, or to specific cons; its goal is simply to help fans of color go to SFF cons and be their own awesome selves. It is funded through donations and an online auction held annually. As I’ve had firsthand experience of being on a miniature budget and having to limit my geeky hobbies accordingly, I decided to add Con or Bust to my list of things worthy of support. This is my third time donating. I’m slowly chipping away at the small piecing / quilting prototypes that I started in February. My goal is to find a good-looking, neat, satisfying and fast way to machine quilt this kind of a pieced surface. I’ve figured it out halfway: I’ll sew diagonally across the small squares to create diamonds at 45-degree angle to the edge. I’ve had a hankering to do some piecing and quilting lately, so prototypes it is! At this stage, I’ve been working on placemats made from two different sizes of squares. The placemat colors are based on a rainbow, with each color moving diagonally across instead of the more static horizontal or vertical layout. After piecing the top on the first one (the photo above), I re-did some color selections for the second one. Better! There are still improvements I could make, but it seems my stash is getting too low on the shades I’d need. 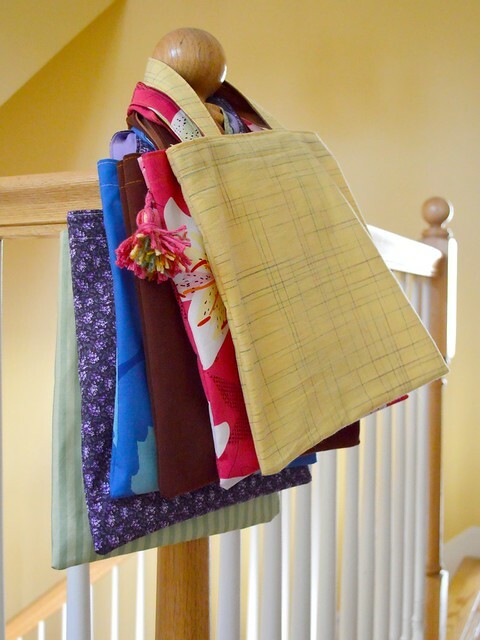 I made and listed two more yoga mat bags. The first has a cheerful, modern floral print. The outdoor fabric is stain and water resistant (but not waterproof), and the bottom and shoulder strap are made with burgundy red canvas. For the second yoga bag, I repurposed a remnant of a calm paisley print in pale aqua and brown. A dark brown cotton with tiny white polka dots makes a nice, strong accent on the shoulder strap. Both are in my Etsy shop now! The mosaic is so neatly and carefully made. Just gorgeous! Jewelry designer Solange Azagury-Partridge’s London home. Via Marie Claire Maison. While there are pieces of furniture with very modern lines, they go quite well together with the ornate stained glass windows, moldings and laurel and vine motifs on the painted ceiling. I really admire Ms. Azagury-Partridge’s skill in pulling together such different elements into a cohesive whole. 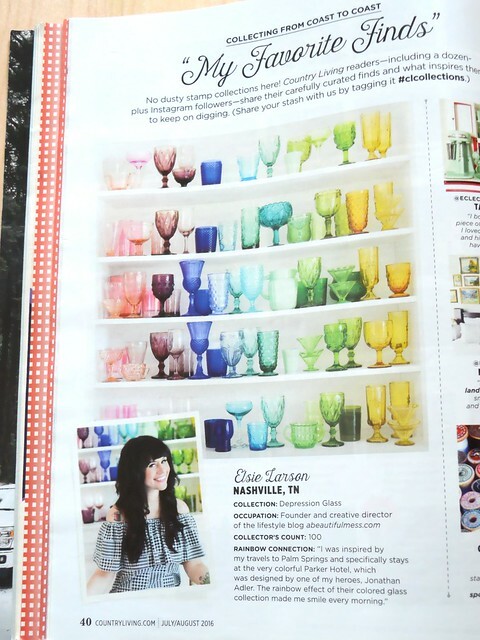 Visit Marie Claire Maison‘s article for more! Found via Making It Lovely. These small book bags / fold-away shopping bags all have slightly different construction or proportions. I kept changing details until I found a solution I was happy with. Shop my book bags here. I’ve been waiting for an envelope for almost two weeks, and finally, finally, it arrived! This gorgeous print is by Filipina artist likhain. As soon as I saw it, I knew I’d have to get it. I will frame it as a present for a loved one.